I’ll be on vacation over the next week and a half so this will be my last post for a bit. There’s a lot to talk about with Isaac right now so lets get to it. Right now Isaac is a tropical storm south of Hispanola with 60 mph winds. It’s currently moving northwest towards Haiti. Isaac isn’t incredibly well-formed but its a fairly large storm. I should also note that Joyce, a system that was a tropical storm just yesterday, has weakened and lost it’s tropical characteristics. It’s no longer any sort of threat. Isaac, still looking a bit ragged. Isaac’s forecast track has continued to shift westward over the past two days. If you remember from Wednesday night’s post it was the ECMWF (European) model that has been predicting such a track for some time. The European model performed very well over last year’s hurricane season and seems to be picking up right where it left off. Right now the ECMWF is putting landfall close to Biloxi. Isaac’s 5-day cone. From the NHC. Currently a direct landfall on Florida isn’t down the center of the track, but the threat to Florida is still very severe. A few models are still predicting landfall over the southern tip of Florida and anyone there, especially on the Keys, should be preparing as if this was the case. This far out, anyone in south or west Florida, or on the panhandle, should be getting ready. This includes Tampa Bay, which is hosting the Republican National Convention. Since the storm is pretty big, a large swath of area will see heavy rains, high winds, storm surges, and possibly tornadoes. As far as storm strength upon landfall, it’s simply too difficult to say right now. Isaac has to cross Haiti and a good portion of Cuba. That interaction with land will weaken it severely, and could even destroy the storm. Right now there is some consensus of it emerging north of Cuba as a weakened tropical storm, with winds in the 50 mph range. Free of the effects of land, the storm will then be over the warm waters of the Gulf of Mexico and should quickly strengthen. It shouldn’t be at hurricane strength as it hits (or passes by) the Florida Keys but would reach that threshold somewhere in the eastern gulf. Again, I must admit, there is a lot of uncertainty in the forecast right now. Last time I mentioned how there was a subtropical ridge guiding Isaac. Each model had a different idea of when and where that ridge would weaken, allowing Isaac to begin traveling northward and having a large effect on where the storm makes landfall in the continental US. I posted a surface weather map and talked about the region of high pressure in the northeast gulf, but I feel like I didn’t give you a true sense of what this ridge is all about. To correct this, I’m going to talk a little bit more about that now. The basic forces that shape global weather patterns: the Coriolis force, the placement of land and sea, mountain and plain, and a general movement of heat from equator to pole creates certain reliable features in the atmosphere. They’re semi-permanent, dependably arriving each summer or winter. 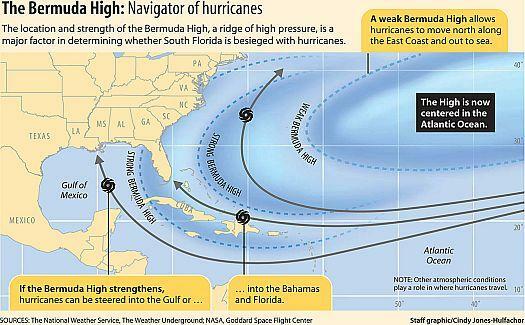 During the North Hemisphere summer, one of those features is called the Bermuda High. It’s a broad area of high pressure that moves from over near in the Azores in the spring to closer to Bermuda during the summer. Winds travel clockwise around it and hurricanes can’t travel through it. That being so, the strength and exact location of the high is one of the most important factors to consider when forecasting tropical storm tracks. Hopefully, another time we can cover exactly why features such as a Bermuda high exist. For the time being I’ll tell you the main points. Over the past week, or month really, the ridge has been quite strong. 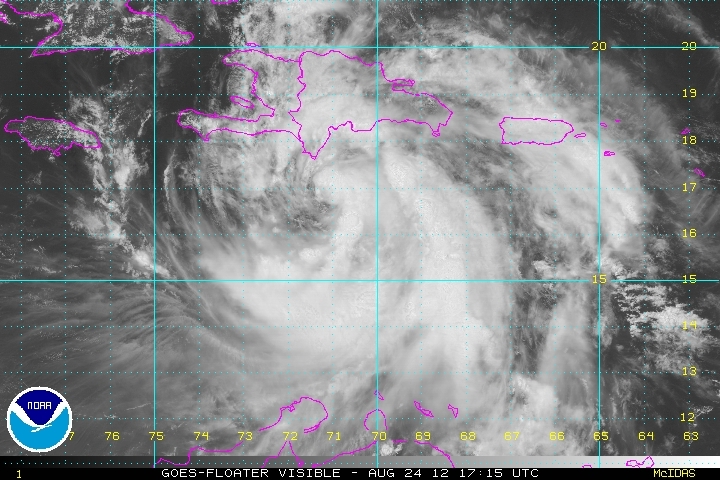 That has affected the path of Ernesto and now Isaac. With Isaac’s forecast track continuing to slip west, it seems the high is going to continue to remain strong. That’s it for today. The blog will be quiet for a while but I’ll still be tweeting updates on Isaac and any other weather news during the down time. See you next time.